DMV.com is the place to learn how to perform New York DMV procedures in an efficient manner. Our easily navigable site allows you to browse NY DMV topics that will help keep you driving safely and lawfully, whether you are looking to fill out a driver’s license application or register a used vehicle. You can also learn how to respond to a traffic ticket and how to avoid a driver’s license suspension. Users of the DMV in New York can also help you with getting a lower car insurance quote on our website. Be sure to visit the DMV.com education center to discover traffic schools and driver education courses in your area. No topic goes uncovered, as we have DMV.com advisors standing by to promptly find answers to any questions that you may have. Search through our site for yourself by viewing the list of topics on the New York Department of Motor Vehicles explored below. The NY DMV requires a drivers license for any motorist in the state. Learn how to get a drivers license, how to renew a license and more. Order your New York DMV driving record online to maximize convenience. Obtain your NY DMV driving history quickly without going to the DMV. Without car insurance in NY, drivers face DMV license and registration suspension. Find cheap car insurance at our online insurance center. Take a New York defensive driving course online. Completing NY traffic school allows drivers to earn up to a 10 percent insurance discount. Test your knowledge of the NY DMV Drivers Manual before registering for the drivers test. Taking a DMV practice exam saves time and money. 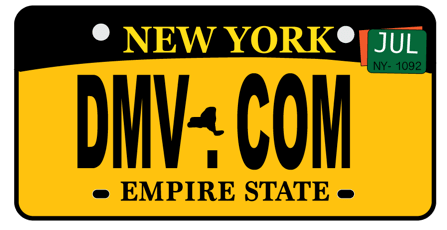 NY vehicle registration is a DMV requirement for vehicle owners. Learn how to get car registration papers and how to renew or replace them. New license applicants must complete NY drivers ed before they can take a road skills test. Learn about DMV drivers education requirements. A New York bill of sale records a change of ownership after a car sale. Learn how to obtain a vehicle bill of sale from the DMV. Learn how to pay a ticket online and how to fight speeding tickets in NY. Drivers must respond to NY traffic tickets to avoid DMV penalties. Driving while intoxicated (DWI) in New York is a serious crime with consequences. Learn about New York DUI penalties enforced by the DMV. Before you purchase a car in New York, consult our online resources. Learn how to buy a car online and complete NY DMV new car registration. New York DMV offices are conveniently located throughout the state. Find a DMV location near you to obtain the DMV services you require. DMV.com is a guide for saving time when dealing with the NYS DMV. Our articles, how-to-guides and resources are for solving motor vehicle issues quickly and easily. We want you to spend less time standing in lines so we’ve built the most accurate and up-to-date site for dealing with issues like getting your drivers license, dealing with vehicle registration or titling issues and all the other issues around driving and owning a car. We’re not affiliated with any New York government agencies so we can skip the bureaucratic nonsense and get you on the road. We’re confident you’ll find what your looking for right here – try using Search at the top of the page or the resources below to get started. We are a privately owned website designed to help you save time and hassle. We want to encourage all our users to be active and involved in the site. Please contribute to our pages with comments or suggestions and join us on Facebook.